Electronic scooters, or e-scooters, have taken a lot of U.S. cities by storm. According to CNN, the leading makers of electronic scooters are Bird Rides, Inc., a rideshare company based in California; and Lime, which is already selling its scooters in 70 cities. The scooters are popular across America and the leading cities of Europe. They’re also leading to serious injuries, as people fall off of the scooters, accidentally drive into traffic, and leave their scooters on the side of the road, creating tripping hazards. In short, while Lime and Bird scooters may be fun to use, they’re becoming a menace to everyone else. 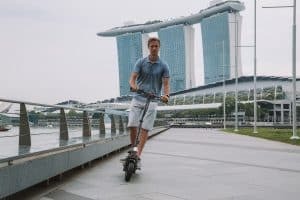 Why are e-scooters such a problem? First off, the scooters are hard to classify. They’re not quite bicycles or dirt bikes, and they certainly aren’t motorcycles. Yet, they do allow riders to go at high rates of speeds with virtually no protection if a rider falls. The scooters can travel up to speeds of 15mph. To put that in perspective, that’s only slightly slower than an African elephant. One of the major concerns is that the e-scooters can accelerate rapidly, making it easy for an inexperienced rider to fly off of one. Just one small bump in a sidewalk or road can cause someone to take a dangerous fall. Scooters have small wheels and wheelbases, which makes it difficult to keep your balance. Secondly, the training for riding Bird and Lime scooters is minimal. Riders can lock and unlock their scooter with a smartphone, so there is no formal training requirement needed to rent the device. Bird has a quick app that just alerts riders to a few common-sense rules. Lime has a video but there’s no requirement to watch it, which means riders are literally learning on the fly. The CNN piece cites multiple examples of people sustaining horrific injuries from e-scooters. One man, who was riding a Lime electric scooter, died when an SUV hit him and dragged him 12 yards. He ended up pinned under the SUV. Another man died when he fell from his scooter on his way home from work. The current laws vary from city to city and state to state. Arizona statutes don’t have anything about e-scooters. They could be classified as a motorized skateboard – “a self-propelled device that has a motor, a deck on which a person may ride and at least two tandem wheels in contact with the ground.” However, if they are motorized skateboards, then they don’t fit the definition of a motor vehicle under Arizona law. Therefore, it is incumbent upon different cities to create and pass their own ordinances. In Scottsdale, that means driving sober, obeying all traffic laws, and yielding to pedestrians. In Phoenix, it means not riding an e-scooter in any public park. In Tucson, it means no e-scooters on city roads – and at ASU, it means no e-scooters, period. If you or anyone you love was injured in an accident involving a Bird or Lime e-scooter, the product liability lawyers at Plattner Verderame, P.C. have the experience and resources to help you get justice. Our Phoenix accident lawyers work with product safety professionals and keep current with the changing e-scooter laws. For help now, please call 602.783.8793 or fill out our contact form. We represent clients throughout Arizona on a contingency fee basis.